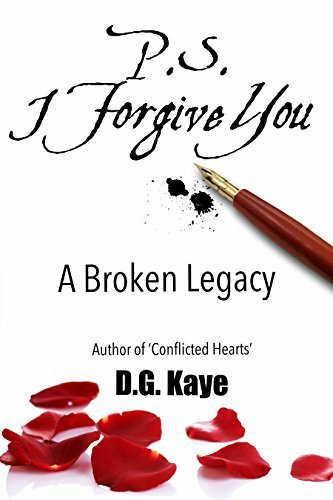 After struggling for decades to break free, Kaye has severed the unhealthy ties that bound her to her dominating mother—but now Kaye battles new conflictions, as the guilt she harbours over her decision only increases as the end of her mother’s life draws near. Kaye once again struggles with her conscience and her feelings of being obligated to return to a painful past she thought she left behind. When I reviewed D. G Kaye’s Conflicted Hearts (http://amzn.to/2iqL3Wc) I wrote “I laughed and cried with D.G.Kaye and finally,applauded her. A wonderful book from a woman of great strength.” On reading P.S I Forgive You I can only reiterate those words yet also add that the author reveals a great wisdom in the acceptance and forgiveness for what she endured in the past (none of which she could control). Her words show an inner peace that many of us, who have been in the same circumstances, may never reach. There is such honesty in D. G Kaye’s writing. P.S I Forgive You is threaded through with sorrow. But it’s not a self-serving or selfish sadness, it’s a lament for a parent who never had any self awareness, who never grew away from that belief we all have as a child; that the world revolves around us. Over riding all that this is an account that reveals understanding and compassion for the author’s mother. This is an empowering book; a must read for anyone trying to make peace with their past in an effort to making the most of the future. This entry was posted in blogging, Book Reviews, Books, Memoirs, Non Fiction, Self Help and tagged #family, Relationships, Reviews by Judith Barrow. Bookmark the permalink. Judith, I am thrilled to learn you read my book, and also want to thank you for this heartfelt review. I’m glad to learn you appreciated the messages in this book. I also hope in some, small way, it may have helped you with what you’re going through in your own journey. Much love xoxo Deb. Another great review for P.S. I Forgive you by D.G. Kaye..head over to Judith Barrow’s post to read in full. This books sounds fascinating. Brilliant review. Thank you, Robbie, it is a brilliant book. Reblogged this on Linda Bradley.